After eleven years residing in a lovely villa at Fisherman Way near Chalong Bay, the dreaded day arrived. It was threatened for a while, then finally it was decreed that our rented home was to be demolished, with the fearsome word “condos” darkly muttered for the future development of the land. Items are carefully wrapped and packed to avoid any scratches or breakage. One of BigMove Phuket’s modern transport trucks. Maybe I should have been more sanguine, shaking my head and accepting that this was the way things were going in Phuket, but I couldn’t help but be emotionally attached to the beautiful oasis of calm and greenery we had found within the mounting tumult of Phuket. The end of May was our deadline and so with a heavy heart I asked friends who were the best people to organise moving our considerable volume of possessions, not to mention our four dogs and two cats, over to our new abode at Land and Houses near Chalong Temple. Interestingly, everyone I talked to had exactly the same recommendation, to trust the job on BigMove Phuket who received ringing endorsements and praise from all my friends. However, it was still with a sense of trepidation that I called them up. Let’s face it, no-one enjoys moving house and my own previous experiences had been upsetting and annoying in equal measure, with several of my beloved possessions having been broken or lost during past moves. 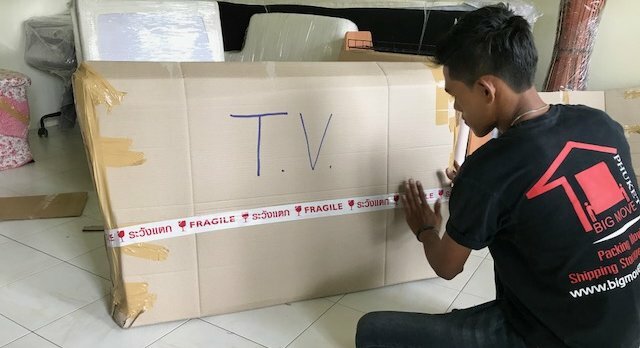 As it turned out, I needn’t have worried, as BigMove Phuket were the very soul of efficiency, caring and organisation, and did everything to put our minds at rest throughout the move. Twenty years ago the company’s founder Mr Wuth Orannukhroh started working for a freight forwarding company in Phuket. 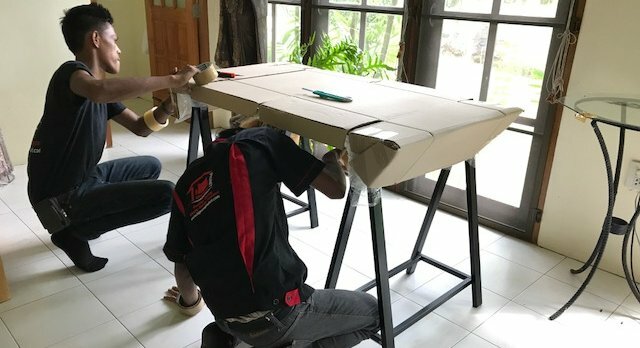 He soon realised there was a market catering to the growing numbers of foreigners who were coming and going to and from Phuket and so he founded his business specialising in communicating with, and meeting the high expectations of, the foreign community. Mr Wuth’s vision was to simply to guide his mainly foreign clients through the whole moving process, while removing their stress and delivering a seamless service, both for relocation and storage. 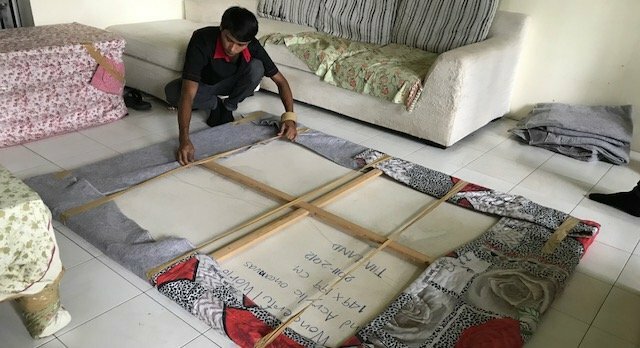 With a deep understanding of the relocation business and its complexities, his key objective was to take care of customers’ belongings as if they were his own. 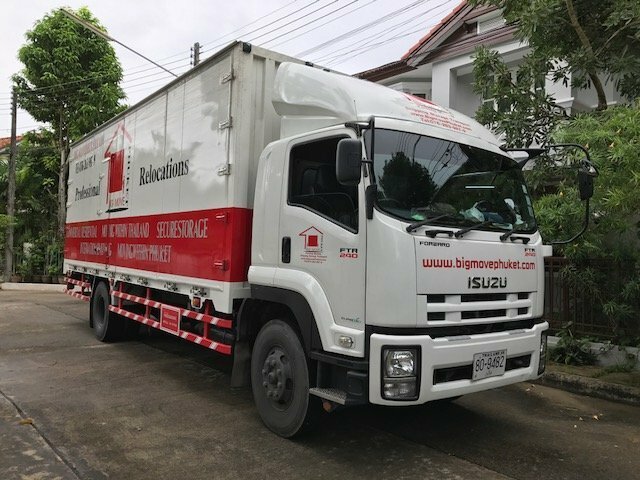 As well as becoming the leading moving company for foreigners in the region, BigMove Phuket has now expanded to include a state of the art secure storage facility with 24 hour security and CCTV monitoring, and can efficiently handle local, Thailand-wide, and international moves. My own first move was to call their Sales Manager Mr Joe Orannukhroh who arrived the next day to make an assessment of what our move would entail and to give us an estimate. Joe is the eldest son of Mr Wuth, the founder, and spent six years of his education in the US, so speaks English perfectly. Joe was extremely efficient, taking photos of all the beloved possessions we had acquired over the years, making measurements and then leaving brand new abundant boxes and packing materials for us to make a start on packing our stuff. BigMove certainly recognise that moving can be an emotional and upsetting time and were at pains to put us at ease with their efficiency and planning. They clearly realise that a successful move is a team effort, and their own team are well trained in their respective fields, making sure that their customer’s concerns are their main priority. They took care of our possessions as if they were their own and our move was expedited without a single loss or breakage. All their staff are full time and have mostly worked for BigMove for a many years. They don’t use casual or temporary employees, and all new recruits to their team go through extensive training and are mentored by senior staff for at least three months. So good were the team at executing our move all in a single day, that we were done by 5pm and I bought all the team food and drinks so we could have an impromptu celebratory party at our new house. They later returned to hang all our pictures for us and re-position some of our bigger items of furniture. Even our menagerie of animals made it safely over to our new home, and then all we then had to do was unpack all the boxes and put our feet up. With over 15 years of experience BigMove Phuket is the number 1 provider of moving and shipping in and out of Phuket Thailand. They also provide storage in a state of the art, clean, secure, storage facility located centrally in Phuket. For more information visit: bigmovephuket.com or call Mr Joe on 081-797-5377. CaptainJack69...but, as the article states, "Interestingly, everyone I talked to had exactly the same recommendation, to trust the job on BigMove Phuket who received ringing endorsements and praise from all my friends." Obviously the competition is not up to scratch and therefore there is need for them to lift their game. I'm not surprised the company in question could afford to pay for this blatant advertisement, being as they charge so much for their services. Don't get me wrong, they do a great job but 'other moving services are available' and you can certainly do it much cheaper.